They’re big. They’re beautiful. They’re bloomin’ expensive. But which is best? What a time to be alive. The new Star Wars movie is mere weeks away, Black Friday is on the horizon and it’s almost impossible to buy a bad phone any more. 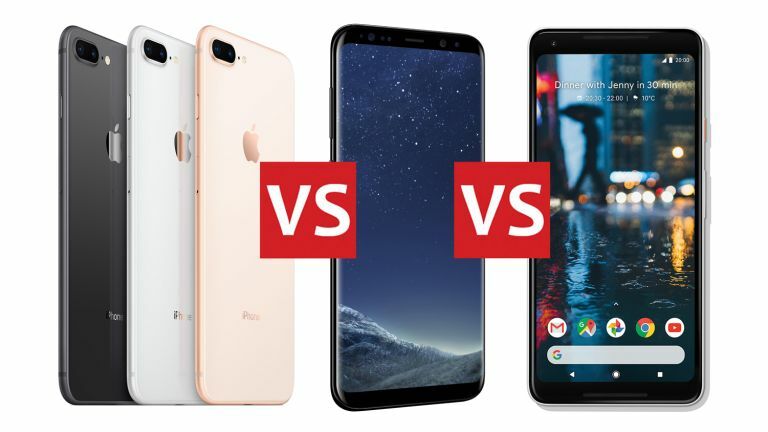 Unfortunately it’s quite possible to spend an astonishing amount of money on a good one, with flagships from Apple, Samsung and Google costing as much as a second-hand car. That’s cutting-edge tech for you, but which phone delivers the biggest bang for its big bucks? There’s only one way to find out. Let’s be honest: the iPhone 8 Plus looks like a shiny iPhone 7 Plus, and while it’s pretty enough it’s looking dated in this company. Rose Gold is gone in favour of a new, slightly pinkish gold shade and the headphone jack is sacrificed for water and dust resistance. The S8+ is beautiful, its screen curving over each side to deliver an almost bezel-free front that makes it look smaller than it actually is. It’s not so pretty at the back, but then backs can be divisive: we’re not sure whether we love or hate the Pixel 2 XL’s two-tone back, although at least it’s a bit different. The front is almost bezel-free, but it’s not as pretty as the Samsung. Like Apple, it’s binned the headphone jack. The iPhone 8 Plus didn’t get an AMOLED display as rumoured; it’s a 5.5inch Retina HD display with 1,920 x 1,080 pixels at 401ppi and a contrast ratio of 1300:1. It also gets Apple’s TrueTone display, which adjusts the colour temperature and balance according to ambient light. It’s hardly a must-have but we like it a lot. As ever, Samsung’s gone for a bright, high contrast Super AMOLED, with a 6.2-inch display delivering 2,960 x 1,440 pixels and the ability to view notifications without turning the entire display on. The Pixel 2 XL is OLED too, with a 6.0-inch display offering 2,880 x 1,440 pixels. It too has an Always-On display for notifications. The iPhone may not look special on the outside, but inside it has Apple’s new A11 “Bionic” processor, which delivers some truly astonishing benchmarks: in Geekbench it scores 4,211 in single-core and 10,102 in multi-core, compared to 1,796 and 6,048 for the Samsung. US versions of the Galaxy S8+ are powered by a Snapdragon 835, but other markets get Samsung’s own octa-core Exynos 8895, which is faster. Google also uses the Snapdragon 835, so we’d expect it to benchmark slightly below the octa-core Samsung. Apple gave the iPhone 8 Plus 3GB of RAM and it’s available with 64GB or 256GB of storage. The Galaxy 8+ has 4GB and 64GB of expandable storage, while the Pixel 2 XL has 4GB of RAM and 64GB or 128GB of expandable storage. Google also offers unlimited online photo and video storage until January 2021.
iOS 11 is the latest Apple mobile OS, and it’s exceptionally fast on the iPhone - especially in new, processor intensive tasks such as Portrait Lighting mode. It’s not dramatically different from iOS 10 but it’s more disciplined and a little less cluttered. The Galaxy S8 Plus ships with Android 7.0 Nougat and Samsung’s own skin on top, and it also gets Bixby, Samsung’s Siri-style personal assistant. An update to Android 8 is expected soon. Google goes with stock Android, of course, in this case Android 8.0.0 “Oreo” with guaranteed software and security updates for the next three years. The iPhone 8 Plus’s camera is extraordinary, with a 12MP dual-lens setup that enables you to get SLR-style portraits and new lighting effects. There’s a wide-angle lens with f/1.8 aperture and a telephoto lens with f/2.8, optical zoom and optical image stabilisation, and the True Tone flash offers slow sync for more lifelike flash photography. It’s capable of 4K recording at 24 to 60fps, and it can save as JPEG and H.264 but much prefers the new high efficiency HEIF ad HEVC formats to save space. Samsung’s camera is superb too, if a little more saturated than the iPhone. Its 12MP, dual pixel processor and f/1.7 aperture are particularly good in low light, and once again you can achieve SLR-style blurring in portraits. In video you can record up to 4K at 30fps. The camera in the Pixel 2 XL is 12.2MP with an f/1.8 aperture, optical and electronic stabilisation and video of up to 4K at 30fps. It’s hard to make a judgement based on pre-release software, but so far it seems that the Pixel is better at detail but the Samsung and iPhone deliver more immersive colours. At 2,675mAh the iPhone 8 Plus’s battery sounds relatively small, but Apple is in the fortunate position of having complete control over both OS and hardware so it can squeeze more out of less: the iPhone 7 Plus battery lasted forever, and we expect the 8 Plus to do the same. Apple has finally added wireless charging too, with support for the Qi standard. Samsung has been offering wireless charging for ages, of course, and the combination of fast charging and a huge 3,500mAh battery means you should never be short of power. By comparison the Pixel 2 XL looks a little less generous with 3,250mAh battery, but its more up-to-date Android should ensure very similar battery life to the Samsung. The iPhone 8 Plus actually seems cheap compared to the iPhone X, which won’t get out of bed for less than £999 ($999 / AU$1,579): it’s a relative bargain at £799 / $799 / AU$1,079. The Galaxy S8 Plus is £779 / $825 / AU$1,349, and the Pixel 2 XL starts at £799 / $849 / AU$1,399. They’re all superb smartphones, but if we were judging on looks alone it’d be the Samsung, which is stunning. It’s also very quick, especially when it’s running Samsung’s own processor, and it has a huge battery and lots of RAM too. The Pixel’s cute too, but in most markets it’s more expensive than the Samsung and likely to deliver slightly slower performance too. For sheer power the gong has to go to the iPhone 8 Plus. Its benchmarks are extraordinary and its processor is clearly delivering desktop-class performance; it’s not a question of if we’ll see Apple processors in MacBooks but when. The camera is superb too, and while Samsung comes very close Apple has the edge in its 4K video and absolutely stunning portrait effects. It’s an iPhone X in sheep’s clothing, offering almost all the power for considerably less cash, and if you aren’t loyal to a particular platform it’s the phone to buy.